Epoxy is a common term used for strong adhesives which are required to be used for bonding - two materials or surfaces together. Epoxy Adhesives are usually two component systems, i.e., two compounds (resins) that need to be mixed together and cured either at room temperature or at elevated temperatures. PARBOND Epoxy Adhesives are ideally suited for applications which involve exposure to hostile environmental conditions. Epoxy Adhesives can be customized to suit the requirement for an application. 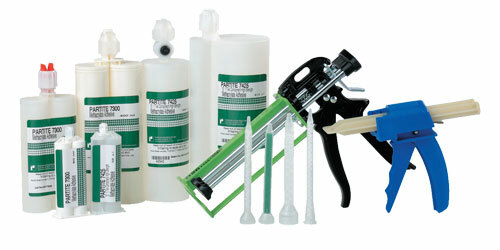 PARBOND Epoxy Adhesives can be made available in a variety of colors. We supply these adhesives to wide variety of industries such as the Automotive, Aerospacem, Railway, Marine, Sporting Goods, Oil & Gas, Sign & Display, Medical Devices, Printing & Graphics, Furniture, Construction, Transmission & Engine Products and General Assembly. Parson has more than 1,200 customer in 43 different countries around the world. Parson produce complete line of two part epoxy adhesives for structural bonding, potting, and encapsulating applications.